The November 6, 2018 midterm election will determine what we can achieve for working families and for our profession. 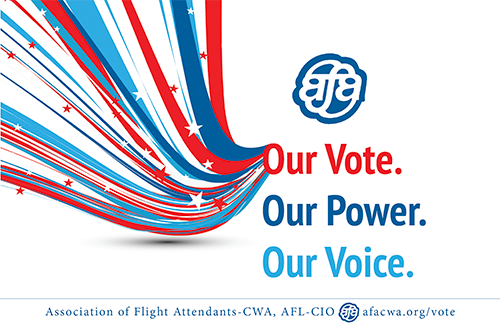 We are counting on every AFA-CWA member to vote. We've been getting reports from Flight Attendants who have voted in the past and thought they were registered. But they discovered their name had been removed from the registered voter list. In some states the deadline has already passed to register, but we still encourage every member to make sure you double, triple check that you are registered to vote! Don't assume you'll be able to cast your vote on Election Day. In our profession, we never know! Cast your vote through Early Voting or get an Absentee Ballot to submit your vote. Talk with your flying partners about doing the same. Voting is key to our credibility with Congress. Turning out in large numbers to vote in November 2018, is a critically important to ensure that our voice is heard. We need a government that supports our work. Your vote on November 6 may be the one that makes the difference in helping to put in place a pro-Flight Attendant environment in Washington. Visit afacwa.org/vote to register to vote, check your registration, and your voting rights.